What Is it: The Chilly Jilly Wrapper Blanket. Price and Where to Buy: $45.00 at Chilly Jilly’s website. Comes with a handy carrying bag. Thin and lightweight but actually keeps you warm. Cons: For a wrap, $45 is pretty pricey. Usefulness: 10/10. Why are airplanes always freezing? We can’t solve that mystery, but the Wrapper Blanket does solve climate control problems. 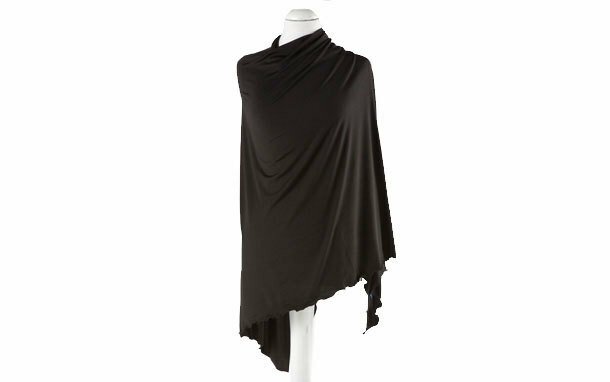 The wrap is really light and we didn’t think it would provide much warmth—but it actually does. It kept us just as warm as a fleece blanket usually does in our freezing cold office—and we looked less ridiculous wearing it. Portability: 10/10. The Wrapper Blanket fits into a 5.5″x9″ bag and would easily fit in a purse or carry-on. Value: 6/10. $45 is expensive for a wrap, but at least this does double duty as a blanket..
Durability: 8/10. The Wrapper Blanket seems well-made, but needs to be washed in cold-water and line-dried. Cool Factor: 9/10. You’ll definitely look cooler using one of these on a plane rather than the horrible airplane-provided blankets, and you wouldn’t look out of place wearing this as a wrap. Final Verdict: If you’re always freezing when you travel, the Wrapper Blanket is a comfortable, although pricey solution!